This little "oil painting" is of a "hummingbird" sitting on a "red shoe." It is actually an IOU for an artist friend of mine. It measures 8x8" on gallery wrapped canvas. I will also have more like this one at the "Celebration of Fine Art" which opens on January 14th in Scottsdale. 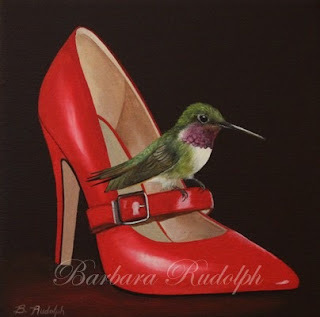 This year I'll have two of these little "shoe paintings" in giclees available too. They will be on my website for sale as soon as they are ready, and will be only $85.00 each (with an easel. ).